Training ride- this is from a quick training ride with my friend Coog, he's going to Iowa too. 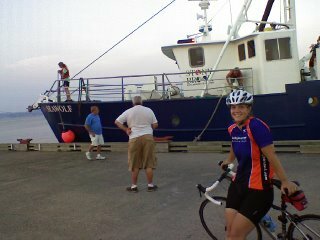 Piermont, NY on the pier- such a great night to ride. I'm riding my old bike here, the K2. Baby has already been shipped to Iowa. I miss her, this bike is heavy and has no pink bar tape. Im really touched to be apart of your blog/expierence thing!! Im really looking fwd to doing this with you!!! We're gonna have a BLAST!! !